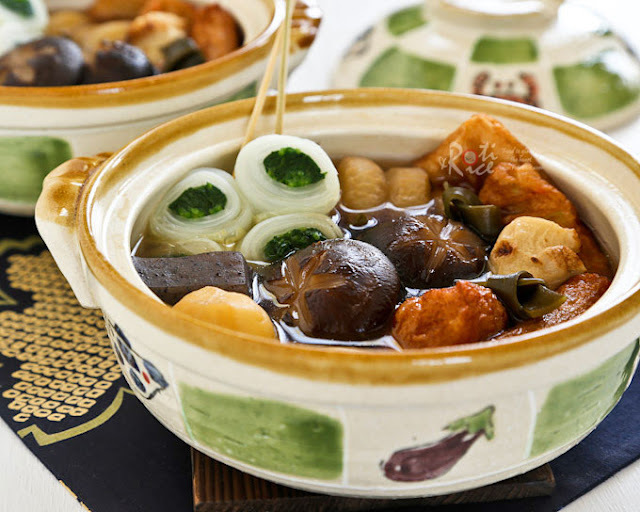 Oden Recipe Japanese Hot Pot- Hello everybody, welcome back with ZetiraKitchen! Today I will share about Oden Recipe Japanese Hot Pot. Oden, winter food from Japanese. Eating Oden is more delicious when it's still while warm. Your body will feel warm when eating Oden. Actually, Japanese people eat Oden for the snack or as a friend to drink sake. With various ingredients put into an Oden pan, then boiled together with sauce (dashi). For dashi and the contents of Oden can be different. Depending on the area and favorite taste people making it. Almost the contents of Oden are daikon (radish), sumire (fish meatballs), konnyaku, boiled eggs, chikuwa, beef, fish, aburaage tofu (fried tofu), squid, octopus, sausages, potatoes, sea clumps, etc. And the ingredients for dashi are made from katsuoboshi, kombu, and, soy sauce. interested to make it? So let's begin! First we made the dashi of oden. Heat 750ml of water and enter wakame. Wait until boiled then turn off the stove. let sit for 5 minutes until the seaweed expands. Lift the wakame, set aside into a bowl. Turn on the stove then put katsuoboshi, soy sauce, mirin, tsuyu kombu and, fish sauce into the wakame water, Mix well dont boiled. Strain Katsuoboshi, return the dashi to the pan over low heat. Add all fish meatballs and just before boiling put the chopped leek and wakame.